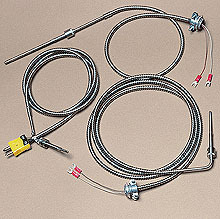 Low cost extruder type bayonet probes are available off-the-shelf in J, K, T, or E Type Thermocouple in both straight thru and right angle tip configurations. Can be utilized with the optional BTC Pipe Clamp Adapters for pipe mounting. Bayonet Pipe Clamp Adaptor, Pipe Diameter: 3 5/16" to 4 1/4"
Nota: * Note: Insert 2 1 /4 or 3 1 /2 : Standard “A” Dimension in space ( ). Longer lengths available at $ 1.00/inch. “B” standard dimensions is 60". For longer lengths, change “60” to desired length, and add $2.25 per foot to price.